The business began in the early 1980s after we purchased our first printing machine from Germany. After then occupying various premises in the Maidstone, Kent area, the company moved to occupy two Industrial units in Staplehurst, Kent in 2008. We have since become known in the industry for delivering a fast and high quality service and can count high profile businesses such as Tesco, Santander, NatWest, Lloyds Banking Group, Honda, Mercedes Benz, The National Lottery, Great Ormond Street Hospital, and the BBC and many more among our clients. We offer durable latex and foil balloons with unique prints you can design yourself. 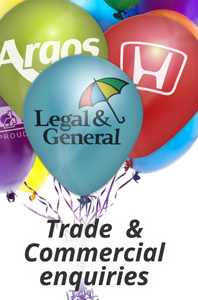 Our personalised balloons come in different shapes, sizes and colours and can be ordered in small or large quantities. You can choose between many different fonts and colours to create the one of a kind printed balloons.